Paul Nicholls has confirmed that the superstar gelding Kauto Star has run his final race. The 12-year-old was last seen being pulled up in the Gold Cup at Cheltenham in March, having suffered a fall in training in the lead-up to the blue riband. Trainer Paul Nicholls and owner Clive Smith have taken their time to make a final decision over whether the 12-year-old should race on, but they have finally decided to call time on a fabulous career. Speaking in his Betfair column, Nicholls said: "The end of an era has finally arrived. Clive was here this morning and we have taken the decision to retire Kauto Star." Nicholls rates Kauto Star's victory in the Betfair Chase last year as one of the most emotional he has ever experienced in the sport. The brilliant 12-year-old, who has run his last race after a fantastic career that took in two Cheltenham Gold Cups and five King George VI Chases, put in a brilliant performance at Haydock on his return to action after being pulled up at Punchestown, prompting calls for his retirement. "He has given me my best days in the sport and, even though the Gold Cups and King Georges are the pinnacles for any staying chaser, with his 2009 Kempton win breathtakingly impressive, the raw emotion that followed his Haydock win last November will live longest in my memory," said the trainer. "I had to hold myself together to stop myself being in floods of tears that day, and I just about managed it. "Kauto is a public horse now, every bit as much as Desert Orchid, and to us here at Ditcheat that had to be a factor in the decision to retire. "And while it would have been brilliant to go out on a winning high - remember Dessie's last race was a fall at Kempton - I don't think anyone present at Cheltenham last March would view Kauto's final appearance on a racetrack as a failure. "The spontaneous applause he got from the crowd when he was pulled up genuinely lifted the spirits of all the team here - and it is the team here, from Clifford (Baker, head lad) down, and Clive (Smith, owner), that made Kauto what he became - at what was a low moment. "Disappointment was immediately replaced by pride, and that is the overwhelming emotion I feel when looking at the horse." He continued in his Betfair column: "Ever since then, Clive and I have discussed retirement. Now the decision has been made it will be very strange to look out of my office window and not see Kauto's head and Denman's arse sticking out of the main two boxes - or indeed Master Minded, for that matter. "Whatever the future holds, I am certain that Clive and all us here at Ditcheat will reflect on a magnificent past and I am sure we will both go on searching for the unattainable in the future. 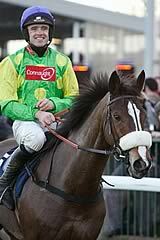 Namely, a horse to replace the irreplaceable legend that was, and is, Kauto Star."